precise positioning, quoting and scaling. 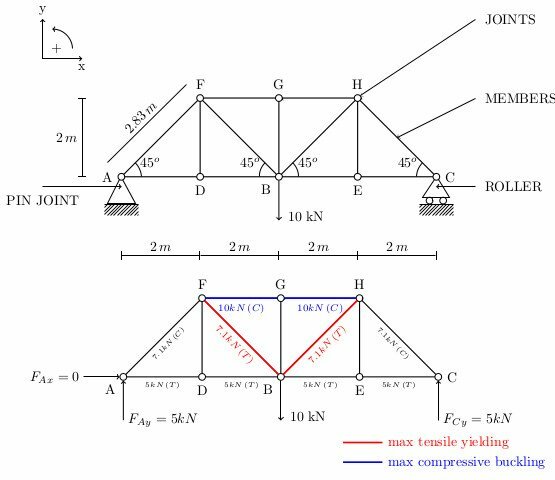 However only writing the small project for the Structure Standing Still: The Statics of Everyday Objects course promoted by Coursera and University of Florida, I have had the chance to learn and try TikZ and TikZ-MEC. In actual fact it exists and it's more complete: pst-stru, a PSTricks package to draw structural schemes in civil engineering analysis (beams, portals, archs, piles), yet it does not work with pdftex nor with any other driver that produces anything but PostScript code1, in fact it is necessary to use latex+dvips+ps2pdf in order to generate a PDF. Also in my opinion the learning curve is steeper and the code is more logical and readable than PSTricks. As usual I put the instruction to install it in your system (Ubuntu and derivatives only) and the possibility to try it online thanks to writeLaTeX and an edited code written by John Lees-Miller2. Typically TikZ is included in the texlive-pictures3package, but if you want to use TikZ-MEC, you have to download it and following the instructions in the README.txt in order to generate the library file tikzlibrarymec.code.tex and the documentation file tikz-mec.pdf. Thus avoiding warnings and errors, I suggest you to install these packages: texlive-science3(it contains SIunits), cm-super3 and cm-super-minimal3. Although I have installed all the packages, I always obtained a lot of errors and warnings while generating the documentation file, but keep calm and carry on: I put this problematic PDF file in my repository on GitHub. The first impact with TikZ and TikZ-MEC is problematic, but if you read the Part I: Tutorials and Guidelines of the manual1, you can understand quickly the code and the power of this Graphics Package. 2. Because at the moment writeLaTeX removes all but the last dot in file names (in order to avoid a bug in includegraphics with files that contain multiple dots) and so it also broke custom TikZ libraries like "tikzlibrarymec.code.tex" that becomes after uploading "tikzlibrarymec_code.tex".